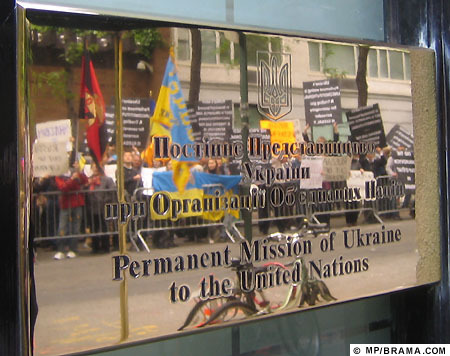 Protest in New York City at the Permanent Mission of Ukraine to the United Nations reflects troubles in Ukraine. 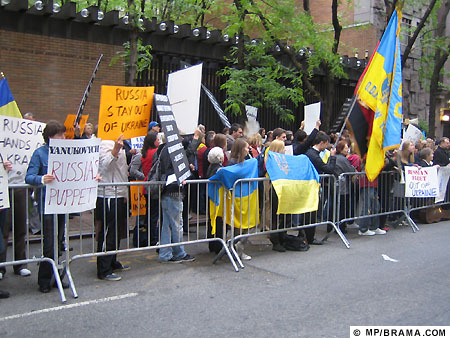 New York, May 12, 2010  Yesterday evening, Tuesday, May 11, approximately 200 protesters gathered in front of Ukraine's Permanent Mission to the United Nations on East 51st Street in New York City. Participants came from all parts of the Metropolitan area. Some came alone; about 40 came by chartered bus from New Jersey. In addition, there were representatives of the Georgian-American community. The gathering was organized by the Ukrainian Congress Committee of America (ucca.org). the removal of the director of Security Service archives, a conscientious scholar who permitted unrestricted access to documentation of Soviet-era crimes. Beginning at 5pm and lasting for two hours, protestors chanted, sang, and gave speeches. New York City allocated and cordoned off ample space for the protesters in the street. No representatives of the Mission came out to acknowledge the group, nor did they make any appearances in the four-story building's windows. As the protest came to a conclusion, the event's organizers urged participants to join a protest at the Ukrainian embassy in Washington DC on Tuesday, May 17, 2010, the day that Russia's President Medvedev is expected to travel to Kyiv to formally sign the extension of the Russian Black Sea Fleet agreement.